In its day, El Bulli was arguably the world's most sought after reservation and there was much lamentation and gnashing of teeth when Ferran Adrià its closure. Then in 2011 Ferran and his brother Albert opened the modern tapas restaurant Tickets which instantly became one of the world's hardest reservations to secure. For those who aren't lucky enough to secure a seat, the Adrià brothers have a consolation prize named Bodega 1900 across the street. 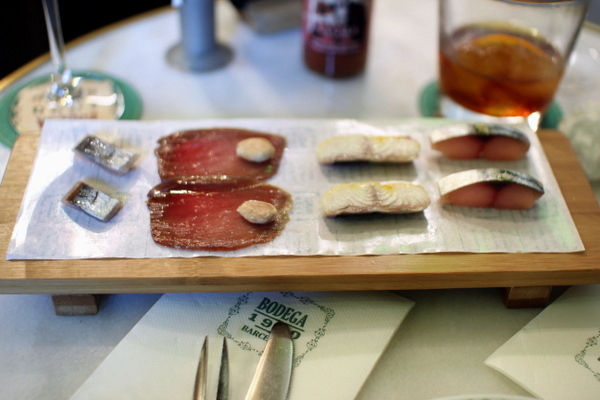 Bodega 1900 takes its lead from the vermouth bars popular at the start of the 20th century and while the restaurant's menu is more traditional than its popular neighbor, it does feature flashes of culinary modernism the Adriàs are known for. Like most tapas restaurants, Bodega 1900 offers an a la carte menu but the staff is happy to prepare a custom menu for its more adventurous diners. 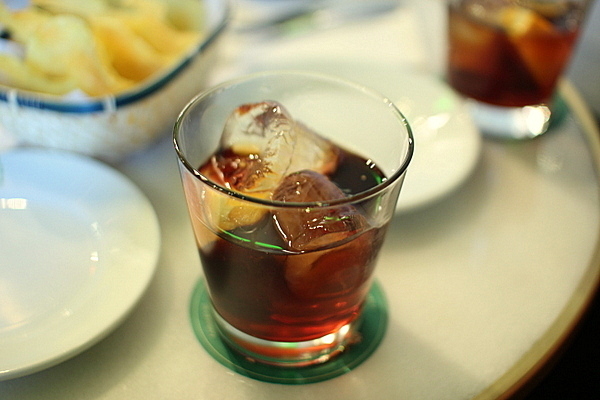 We started the meal with a cup of the house vermouth. The cocktail is primarily made of the ubiquitous Martini Rosso cut with a bit of their limited Gran Lusso. The cocktail has a hint of sweetness coupled with bitter herbs and citrus clean that was akin to a lighter more fruit forward Negroni. The tasting started off with a few snacks to accompany the aperitivo The chips were thin, crispy and equally delicious with the subtle vinegar-y bite of the house made hot sauce or alone. 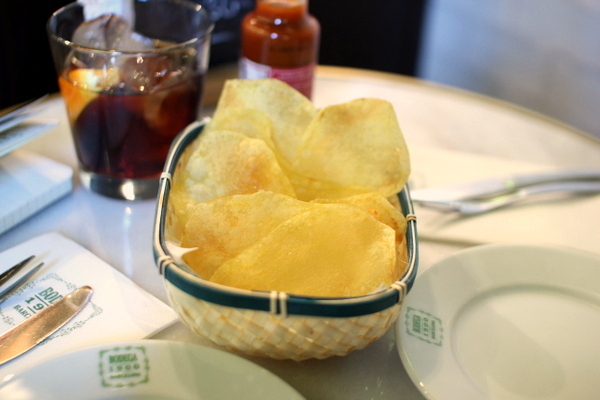 The potato chips while enjoyable, lacked the panache befitting an restaurant. 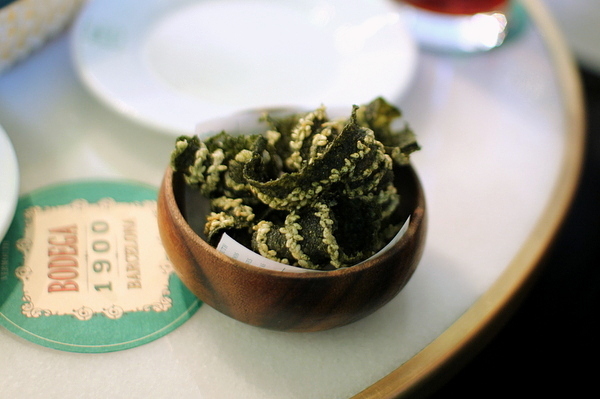 The second snack was a bowl of deep fried seaweed, equally airy and crisp but with a more nuanced umami flavor and a tinge of sesame to boot. I've never been a fan of shrimp cocktail. The dense overcooked shrimp and blunt cocktail sauce feel more suited to a mediocre buffet rather than a fine dining establishment. Happily, this far exceeded my expectations with a snappy rare texture and fresh sweetness. The sauce was similarly elevated, with a tangy zing that deftly complimented the flavor of the shrimp. 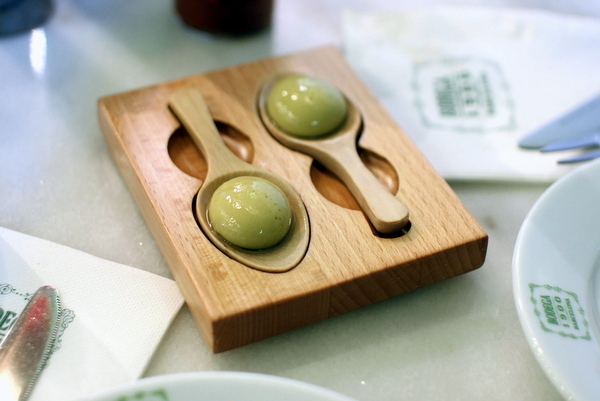 These were a nice change of pace from the ubiquitous olives served at every other tapas joint. The creamy spheres popped releasing a pure olive note tinged with a touch of anchovy-like salinity and smoke. Next up was delightful crab salad. The strings of tender snow crab are smothered in a mixture of creamy avocado and pungent romesco. The salad would be a bit lopsided texturally were it not for the crusty toast point the dish was served on. For this course, took a page out of classic Jewish deli fare. 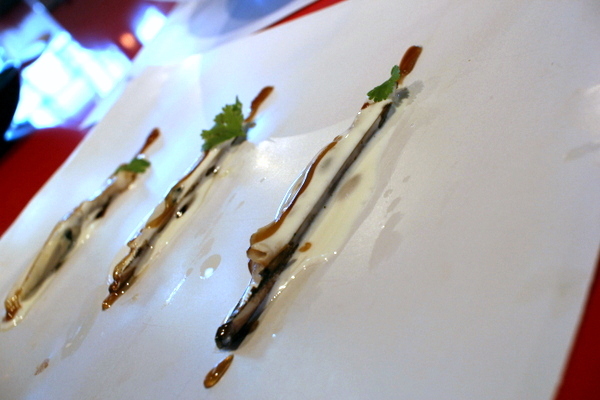 The sliver of smoky salmon was governed in a glistening sheen of truffle honey. The interplay between the sharp smoke and sweet honey was further elevated by the touch of lactic tang and the accent of the dill sprigs. 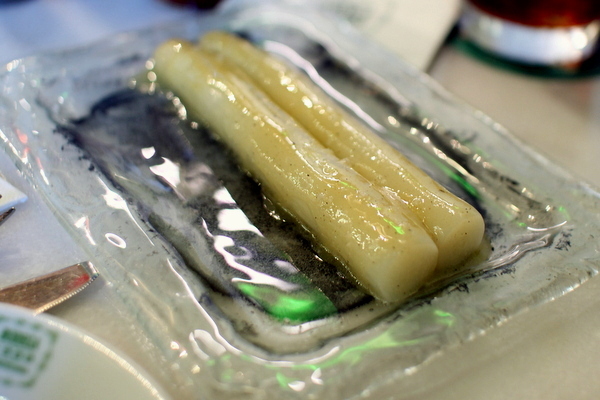 White asparagus is something of a rare treat at home so I quite enjoyed these sweet fresh stalks. The asparagus was boiled then seasoned with salt, pepper, and a mustard glaze, simple yet effective with the succulent vegetal sweetness of the vegetable. 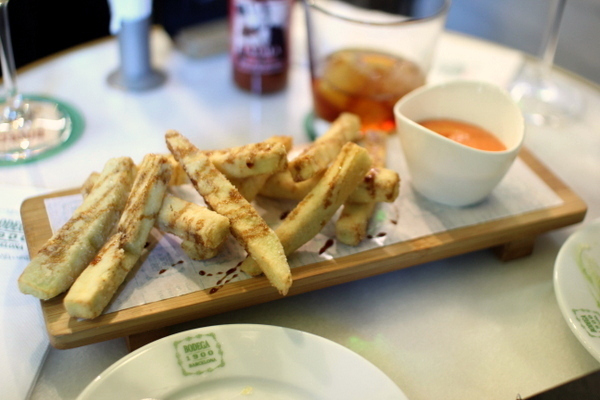 This was a rather whimsical preparation of eggplant, cut into thick sticks then deep-fried akin to French fries. Beneath the thin fried shell, the eggplants had a rather creamy consistency. The piping hot filling contrasted wonderfully with the chill of the salmorejo which also conveyed a lovely springtime levity. I didn't know there could be name brand oysters but yet here we are. The Gillardeau family has been raising oysters since the turn of the century and by that I mean the twentieth century. 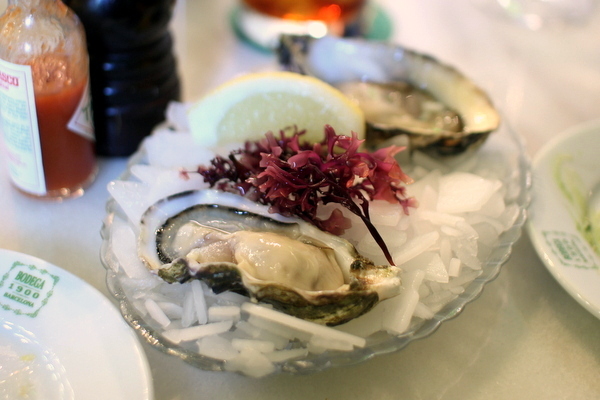 The self-proclaimed "Rolls Royce of oysters" were on the meaty side but with a fresh mild salinity and a supple creamy body. The lightly blanched razor clams were a big change from the previous course. The deep saline flavor and dense supple snap offered by the clams were heftier than I was expecting as was the astringent tang of the Escabeche sauce. Given Spain's penchant for pork, I was surprised to see the charcuterie was all fish but from start to finish the selections were excellent. First up was a simple mackerel, the smoke a natural compliment to the fish's inherent oiliness. The most elaborate of the quartet was an eel with saffron, the smoking gave the eel a denser feel while the saffron added a touch of the exotic. 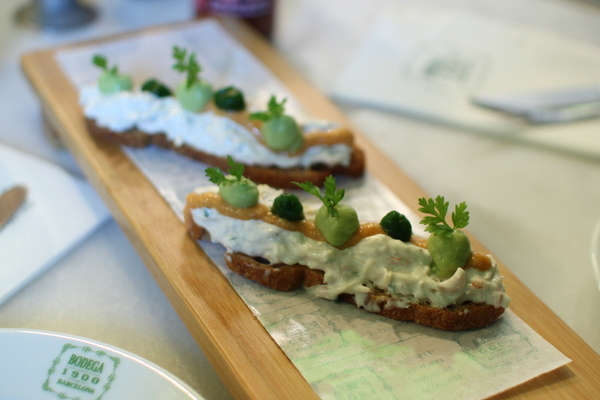 Following the eel, the tuna was rendered surprisingly mute; still it was easy to appreciate the fish's even tender texture and the contrasting toastiness of the hazelnut accent. last but not least was the sliver of sardine, which packed an immense amount of flavor into a very tiny package. Rubia Gallega or Galician Red, refers to a specific breed of cattle that comes from the Galicia region of Northern Spain. 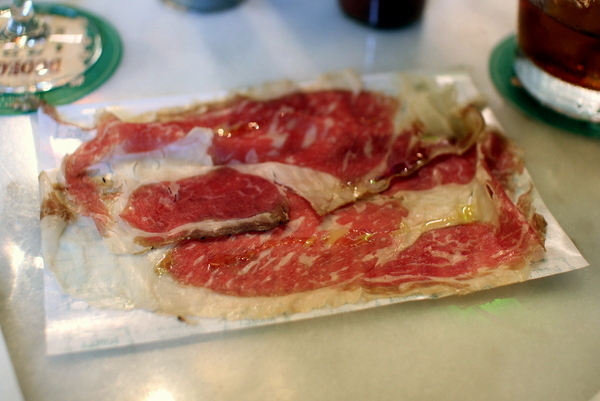 The beef has been cured for three weeks in salt then sliced paper thin, the result is an airy sliver of meat that exhibits a harmonious blend of beefy power, butter, salty smoke, and meaty umami funk, the absolute favorite of the evening for both me and my girlfriend. 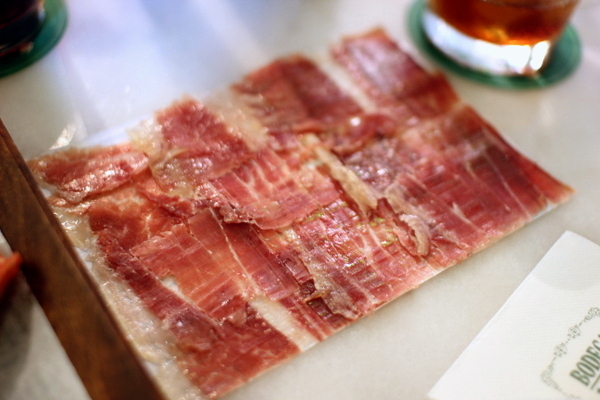 No tapas meal would be complete without a serving of prized Iberico ham. 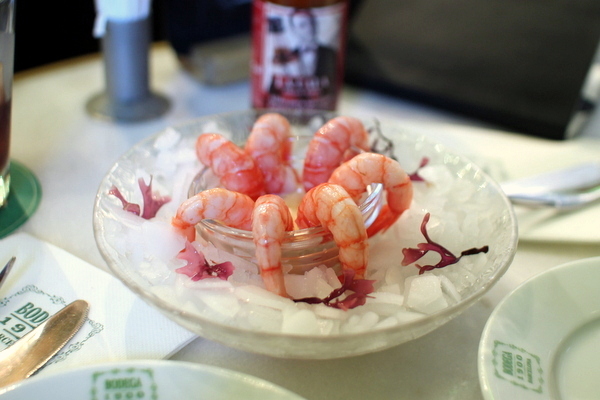 The brothers source theirs from Joselito, a family run business that has been in business for over a century. Aged for a minimum of five years, the meat has the fine creamy consistency and rich depth of porcine flavor but truth be told it was hard to see a significant difference between this and other top Iberian ham. The tomato was the perfect remedy after all the cured meats. 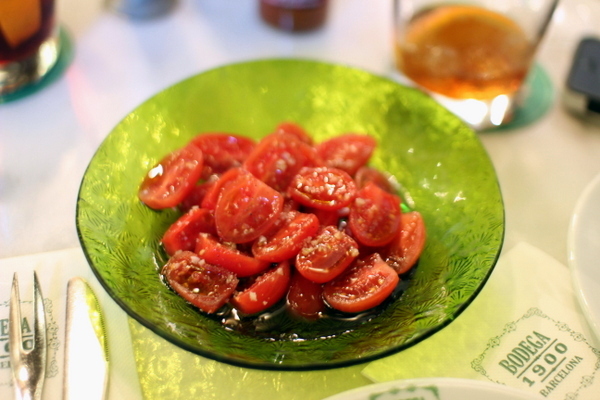 Glistening ruby hemispheres of fresh tomato came drizzled with olive oil and coarse salt adding a fruity salty savor to compliment the sweet succulent fruit. 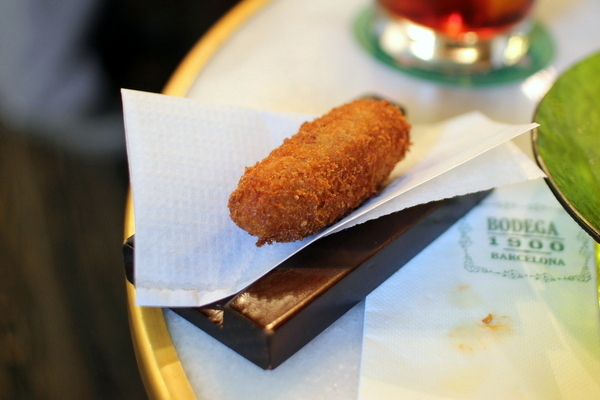 Moving onto the heavier cooked tapas, we started with a classic croquette filled with rich bechamel imbued with the profound porcine profile of Iberico pork. Mollete refers to a type of soft white Andalusian bread that is usually served lightly toasted and drizzled with olive oil or lard. 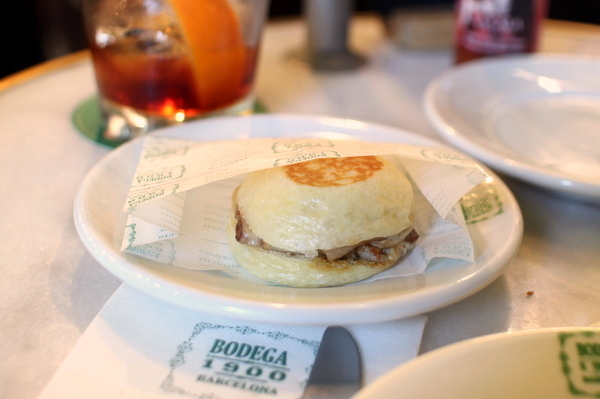 At Bodega 1900 the bread was filled with a mix of melted gruyere and tender pork cheek. The simple sandwich celebrated the effective combination of the two ingredients highlighted with a slight mustard kick. 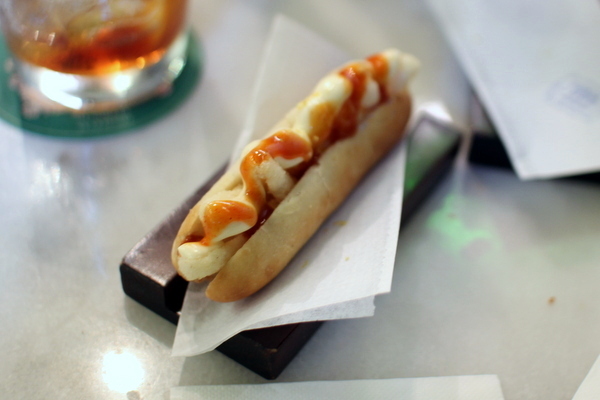 Mollete de calamares picantes - Spicy squid "Hot Dog"
The Adriàs decided to channel some Korean influences for this dish, seasoning the mild calamari with a mix of kimchi chipotle and aioli. Much blunter than the previous offering, the dense bun and clumsy mix of sauces overwhelmed the delicate flavor of the squid. 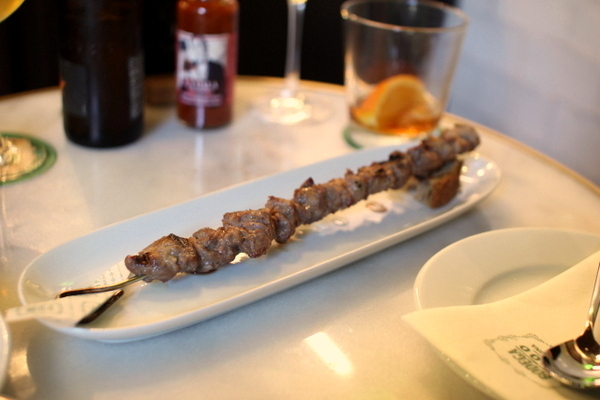 At this point my girlfriend and I were getting pretty damn full but when we were presented with a skewer of grilled Iberico we found just a bit more space. Literally translated as the Feather Loin, the Pluma is cut from a fattier section the shoulder giving it the textural nuance of lean pork with the full throated flavor of fattier cuts. The meat was reminiscent of a yakitori style preparation, grilled and simply seasoned allowing the smoky char and richness of the meat to shine. 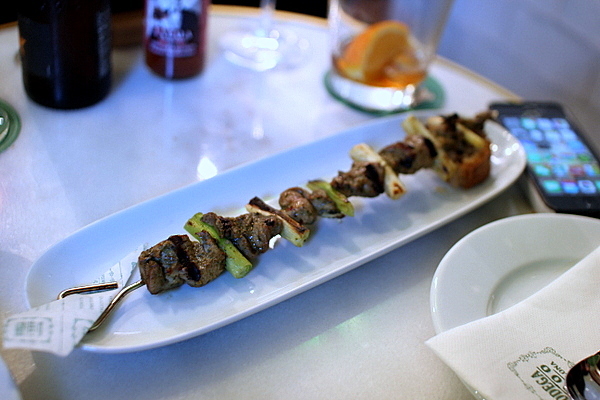 We were also presented with a skewer of lamb contrasted with sweet onion. 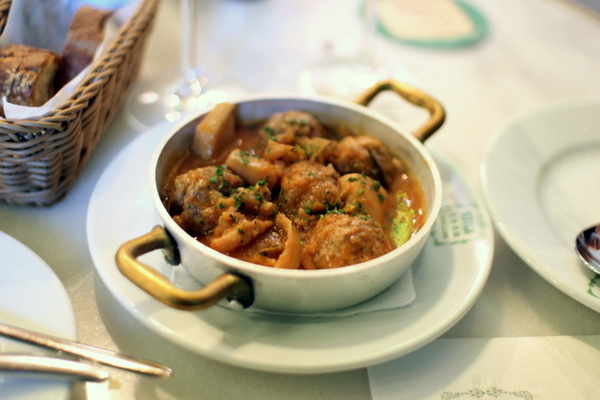 A less elegant meat than the Pluma, the lamb benefited greatly from the fresh springtime contrast of the onion. I expected a bit more from this course. The meatballs were pretty classic but rather one dimensional despite the inclusion of the cuttlefish. Coaxed by our server, we opted to start dessert with a light fruit chaser. 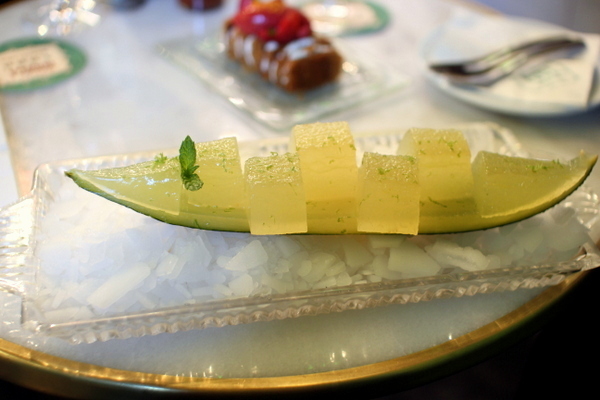 The melon takes on a Jello-like consistency and a surprisingly boozy heft to compliment the fruit's inherent sweet succulence. 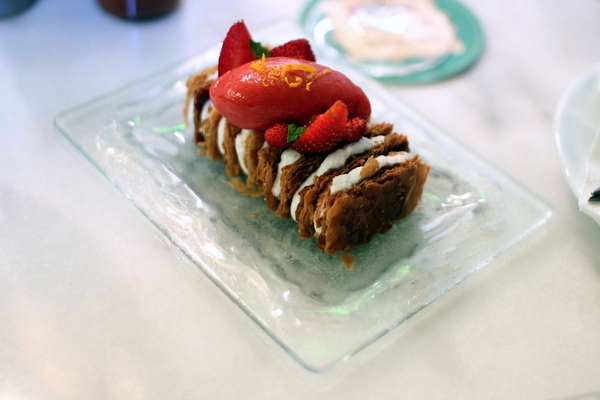 Our final dessert was a take on the classic Millefeuille. The puff pastry was caramelized giving it a more pronounced butteriness and denser crunch making it a fitting foil for the exuberant strawberry sweetness. The food strikes the right balance; exemplifying the best of traditional tapas style cooking while celebrating the of creativity and dynamism of the brothers Adrià. 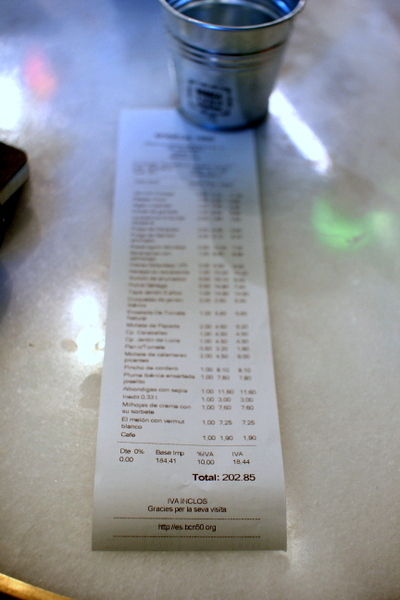 Our dinner at Bodega 1900 was everything I could have hoped for and the double-take that our server gave when he saw the bill provided a humorous exclamation to a wonderful meal. In the States, the term Asian Fusion is something of a dirty word in most culinary circles, conjuring images of the bad old days in the '80s and '90s. 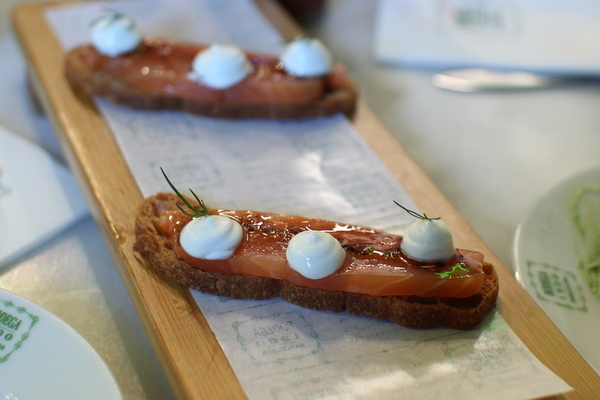 But in Spain, wunderkind Chef David Muñoz has raised fusion to an art form. His fine dining restaurant DiverXO recently got its third Michelin Star and to my surprise, is the only 3-star restaurant in Madrid. Unable to score a seat to the temple of Latin-Asian fusion, we contented ourselves with a visit to StreetXO his more casual joint situated at the top floor of El Corte Inglés, high-end department store. 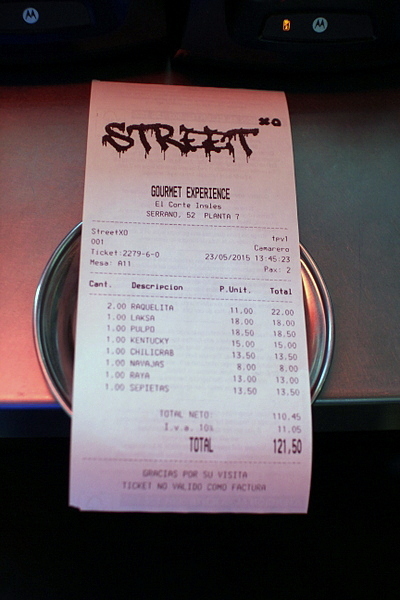 StreetXO offers a very impressive array of contemporary cocktails to accompany their food. Unable to pick from the many tantalizing choices, we finally asked our server to surprise us. The Raquelita turned out to be an Asian riff on a White Russian with lemongrass, coconut cream, and passion fruit in place of coffee. 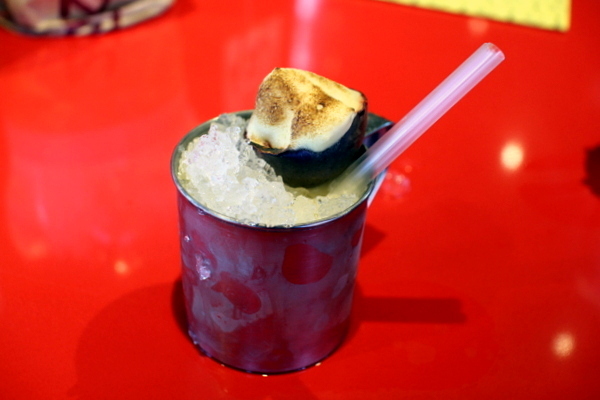 The creamy sweet cocktail even came with a chaser of tangy passion fruit meringue. My girlfriend developed quite a fondness for Laksa from her ex-pat days so this was definitely a must order. 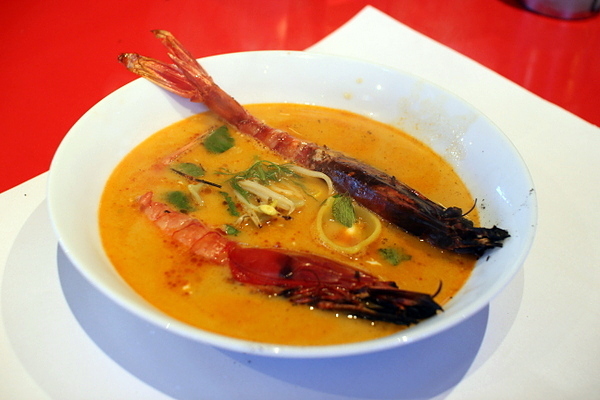 We were presented with two prawns that were quickly bathed in a golden bisque-esque that oozed char, acidity and spice. The prawns were equally impressive, prized deep sea Carabineros, their flesh was translucent and silky while the head was filled with decadent offal-tinged saline. 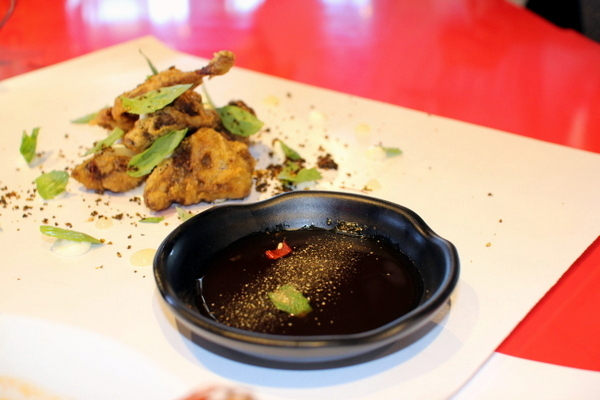 Next up was a deep-fried quail served with a ponzu spiked with Szechuan peppercorns. On its own the bird is quite the treat, firm and moist quail covered in a thin crispy shell. The sauce adds a piquant numbness and slight pungency that I enjoyed though only in small doses. Octopus char siu? Yes, please! 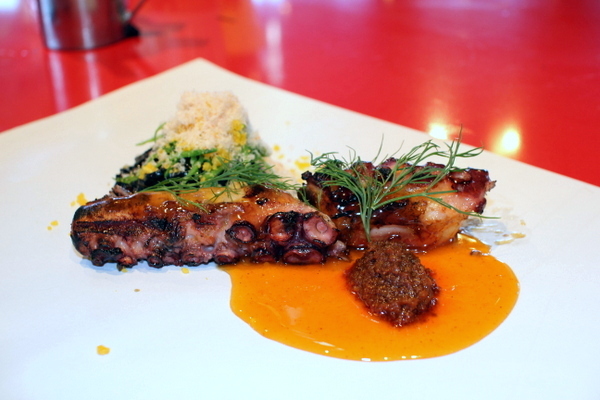 The pulpo was paired with a touch of hoisin and sweet chili. The combination had familiar char siu elements that played very well with the inherent smokiness of the octopus. The accompanying squid ink noodles were appropriately dense and seasoned with shrimp paste. The funky umami heft of the noodles was deftly balanced by the sprigs of fresh dill. Next up was a pretty faithful rendition of the popular Singaporean Chili Crab. 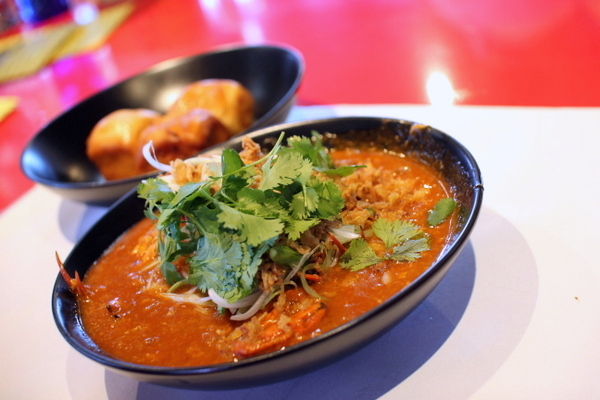 The crab itself plays second fiddle to the thick chili sauce. This version paired cayenne and chipotle for a smokier heat with a touch of palo cortado sherry. As enjoyable as the crab was, the best part of the dish was the mantou beautifully golden on the outside with an light airy center this was undoubtedly the best mantou I've ever eaten far outstripping the traditional bland steamed buns. 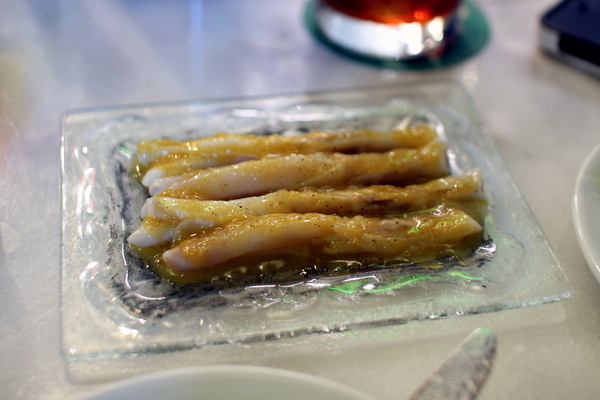 Razor clams are a relatively rare treat back home but surprisingly plentiful in Spain. Sadly this smoked preparation a bit lacking in both snap and flavor; errors that were further compounded by the coconut cream which was heavy handed both in sweetness and the thick creamy texture. The cuttlefish itself is perfectly cooked but serves as little more than a textural element. 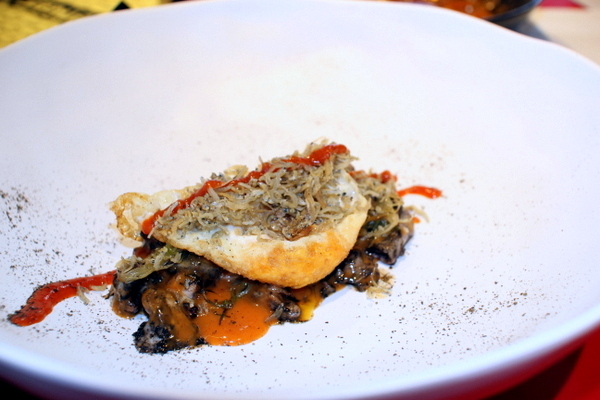 The flavor came from the fried egg and the even more deep-fried sardines, with a kimchi sauce the whole affair in a pungently spicy bow. At this point we were bursting full, but seeing the table next to us tuck into the skate we couldn't help ourselves. Despite the gluttonous excess, this proved to be a great choice. 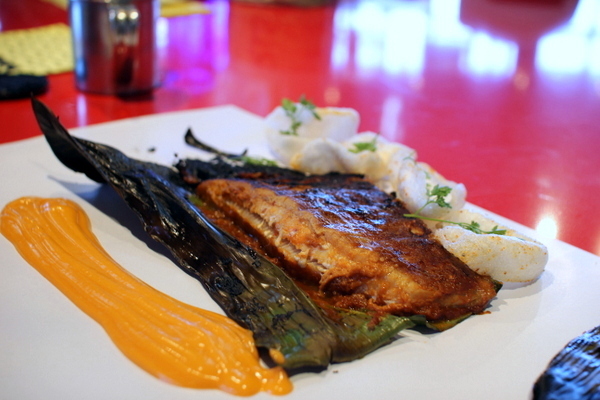 The skate displayed a multifaceted texture flaky meaty strands wrapped in a glutinous succulence. The banana leaf imparted a heady savory char to the meat while the sauce added a healthy kick to the mix. I have to say, I had my doubts about StreetXO. The "fusion" stigma, the urban-hipster vibe, and its location in a mall had me worried, but the bold, lusty flavors effectively married the best from Asian and Latin cuisine with a healthy dose of funky iconoclasm thrown in. Add to that the impeccable cooking techniques and I found myself agonizing over just how good the three-star version must be. After gorging ourselves at StreetXO, a visit to DiverXO is an absolute must for me and my girlfriend next time we are in the neighborhood.